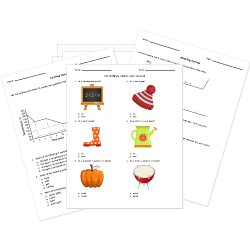 These properties of matter worksheets are designed to support elementary physical science students through high school physics students develop understanding of physical and chemical properties of matter. Worksheets labeled with are accessible to Pro subscribers only. Become a Subscriber to access all premium content. Don't see a printable you need? Use our Test Maker™ to create your own printable that fits your needs. Browse properties of matter questions or use our advanced search to find existing questions while filtering by grade levels and keywords. You can also create your own questions.